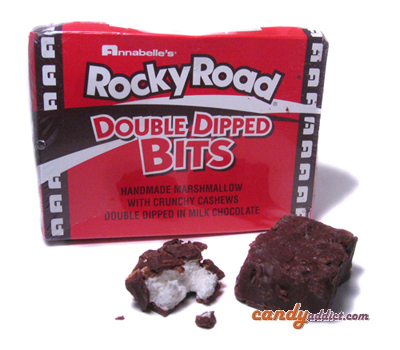 Rocky Road is still all handmade, and these new Double Dipped bits are no exception. Once you see this bar unwrapped, you understand how this candy earned its name. It’s flat and wide with a very textured surface that resembles, well, a rocky road (or a cobblestone street, your preference). The bar smells very sweet, with notes of cocoa, vanilla and coconut. It’s a very appealing smell. The first bite is nice, but a little crumbly. The flavor is nice and mild: some marshmallow and vanilla hits from the marshmallow, a little salt and crunch from the cashews, and a good sweetness from the chocolate, but surprisingly not as much cocoa flavor as initially suggested by the aroma. The texture is great with the incredibly soft and spongy marshmallow, the smooth chocolate and the subtle crunch of the cashews. 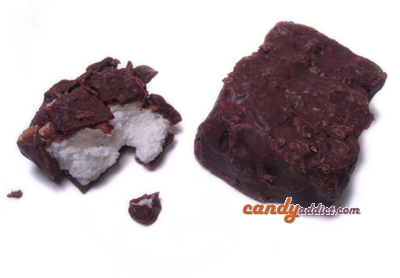 This bar is a nice snack due to its smaller size and light feel but very satisfying flavor. It gives a good sweet hit and will satisfy a craving without much guilt. On the same wavelength, is could also be a bit dangerous if you don’t pay attention to your snacking habits; you could easily eat the whole box without much thought. The new packaging is great too so I can easily stockpile them. This is especially important since Annabelle’s candies are nearly impossible for me to find where I am out East and this way it’s a little easier to get my Annabelle’s fix anytime I want.